Copper is essential to our lives, is found in all electronics, our electric motors and grid...and is already 80% recycled. Copper's re-use yields higher purity copper every time it re-enters the supply chain. There are no losses, except for copper that ends up in our landfills, and more importantly, the copper production dregs that end up in mining landfills known as tailings. The former is ok -- because in the end, the copper finds its own way into the plants we eat. Copper is a trace mineral necessary for our optimal health. But the copper in the tailings are man made earthen dams and pools of intentional piling on of clays and chemical treatments, sometimes called 'Paste'. Keeping toxic levels of acid drainage and metals out of Mother Earth´s water delivery systems is a challenge. Natural streams and water systems, gratis of Mother Earth, are formally and legally call Ecosystem Services. We ask as several already have but in the realm of other natural resource regimes and environmental study: are not all mine tailings literally an invaluable Ecosystem to be recovered? And if so, why are they off-book liabilities more often than not left to grow without questioning their true impact upon the Deep Ecology of Humanity and Spaceship Earth? Historically, the man made tailings and their earthen dams have and will fail. They are simply one generation´s castles in the sand passed on to the next as contaminated mud. We ask: Is this ethical? Is not copper in mud also recyclable, recoverable? Should not we clean up these tailings entirely as part of everyday mining, sun up to sun down? Is that naive to ask? It is the 21st Century: We Thinks it is time to redefine the definition of 'What is a Mine Closure and acceptable Mine Closure Plan'? The fact that copper is recyclable and able to theoretically be fully recovered, day by day, is copper's best kept secret. Unlike a pot of gold at the end of the rainbow, copper is actually there! 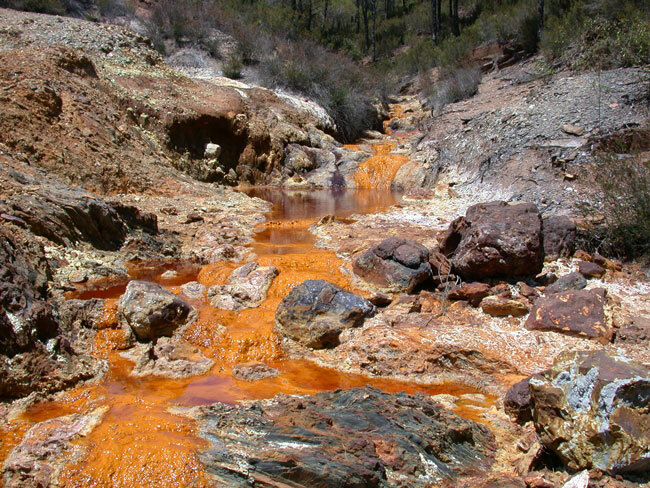 There are over 4,000 metal mining tailings, globally of varying size and contamination levels. We think a good place to start a thorough understanding if you are interested is to check out current work by 21st century environmental archeologists per thorough conclusions about the pervasiveness through time of the Roman's key copper mining district in Jordan. The environmental impact of mining and metallurgy is an issue that has affected societies in the ancient Near East over the past 8000 years. If you prefer modern history, check out remediation work done over the last 50 years in the UK's southern coastal Wales Swansea area that was the 19th/early 20th century receiving crushers and smelters for New World copper ore coming from the Americas. Half a century of achievement in cleaning up one of the western world's most blighted industrial corridors offers many lessons for land remediation and regeneration. And let us not leaving out the cause and effect of 22 Superfund sites resultant from the industrialization of the U.S. West enabled by Americas Smelting & Refining Company (ASARCO) vast mining and smelting operations. Up until 2006, ASARCO was the second largest U.S. copper mining company when it was undermined by its own negligence of its unattended liabilities (highly pollutive smelters and mine tailings across the U.S. West). ASARCO was toppled in an unprecedented foreign hostile takeover which became the largest environmental bankruptcy known to mankind. The ASARCO Bankruptcy and its revelations inform current Climate Change policy in a new book not yet released: The Convenient Truth: Clean Copper. Now we divert for a moment to learn about copper by comparing copper to its Extractive cousin: Fossil Fuels. Oil & Gas, and Coal on the other hand, cannot be recycled. To put the genie back in the bottle after combustive use is like asking to bottle pollution. There are those that argue C02 sequestration is the panacea for abatement of atmospheric Greenhouse Gas Emissions and cities' pollution. But C02 has never reduced a city's smog cloud, nor is it beneficial to anybody but the oil companies seeking tertiary recovery of more oil from their own historical oil fields. The practice of recycling relatively small amounts of C02 in order to recover more oil to be combusted surely is not a fix for cleaning the air we breathe. Fossil Fuels are only "necessary" for as long as the Oil & Gas Industry, that is, the powers at be, continue to own and self-perpetuate the supply chain's transport infrastructure and dependency upon their flavor of fuels for our future. While this Polluters' Panel continues its neo-luditism (refusal to progress past old technologies and embrace the new), rest assured, the rainbow amidst the rain, the specter of a non-depletable Hydrogen Revolution, is all around us, awaiting our awakening to its pot of gold. But Hydrogen's rainbow will never come forth without you demanding Hydrogen now. The Hydrogen Fuel Cell cars are ready for mass market production. But where is their Hydrogen at our pumps? Hydrogen fueled the Axis during WWII. Hydrogen put man on the moon. Do your own homework, ask critical questions. Don't be fooled by Black Gold. Understand clearly the difference between Mother Earth´s depletables and non-depletables. Clean Copper™ Supply Chain Alliance, pbc exists as a place for any consumer to supplier, manufacturer, enterprise customer and all that make up our global economy to go to if they want to BOLT for a Fossil Free Future. We exist to JOLT your comprehension of current frameworks we are told to call out as PARIS COP21 TALKS, SUSTAINABILITY, CARBON ALLOWANCES, UN IPCC, CLIMATE CHANGE PROTOCOLS and more. While these solutions for the restoration of our planet to blue skies and clean air may be working, did you know there is a generation of millennials that find this hard to believe? Many millennials are truly despondent over how Baby Boomers of the 60s and 70s have managed to destroy Mother Earth's backyard -- which leads us back to the piles of dirt that have been excavated over the last 100 years associated with copper mining. Clean Copper™ is not a framework, nor a new regulation. It is not a policy, nor a metric to be counted. Rather, it is an EASY BUTTON, something FUN & POSITIVE that we can all rally around as our own consumer-supplier Moonshot Mandate to End Oil Within the Decade. We call this Life Without Oil™. And yes, we are shooting for Life Without Oil™ within this decade, 2016 to 2026. With your help, we can all do it, knowing we are all working towards an emissionless energy future for our children, versus an impossible goal of achieving something in the sky called 2º irreversable that none of us are in control of to do anything about. Clean Copper™ is the antidote to Fossil Fuels, albeit it is not, at first, intuitive. But we are certain that a show of Downstream Demand for Clean Copper™ -- literal Clean Copper™ defined as Zero Emissions, Zero Waste at the point of extraction, production and refining -- can create a tsunami wave of Solar & Hydrogen refinery science to sweep throughout the supply chain. We the phenomenon that is theoretically proven and prescribed herein: The Convenient Truth -- Clean Copper™. Go here to Pre-Order the Book. Oil re-use could be defined as sequestered CO2 for the purposes of tertiary recovery. (Yep, this is what they use it for.) But, tertiary recovery is not on the critical path to ENDING Climate Change, but rather exacerbates the problem. We can deduce CO2 sequestration serves those that benefit from The Carbon Tax and its derivatives. They might tell you otherwise. Experts report off-record that 40% additionally more coal is required to be burned in order to sequester their CO2 that makes for so-called Clean Coal. You decide what is your threshold that defines insanity. We as consumers are misinformed if in our heads we think we as a society, a nation-state, a civilization cannot carry on our "modernity" without oil, gas - and coal. Will you continue to believe "...but the infrastructure costs are too cost prohibitive to change to Hydrogen"? Have you done the math? Why do the Gulf Coast refineries all start their cracking processes daily with hydrogen? The Infographic below registers the price of copper at $6,500 / tonne. Copper is at an historic nadir and currently trades at less than $5,000 / tonne. What is this Clean Copper™ - Hydrogen nexus we are inferring here? Many perceive that the world "runs on" crude oil -- and indeed, crude oil serves up 95% of our transportation fuels. But, we argue it is the copper, alone, that makes our world economy go around. The price of copper depends currently, on the price of oil, but the global GDP and China´s growth can be proven to depend solely on their price of copper and its availability. ​One must imagine: if the copper mines were to all run on solar & hydrogen (near Zero Emissions), then the price of copper would be based upon these non-depletables (already at grid parity and without oil price volatilities and waste streams) versus the price of oil. And if so, the next economic stimulus to an ailing world economy could well be decided via allied Downstream Users of Coppers (aka Clean Copper Supply Chain Alliance) vs. the Copper Mining Company Board rooms. There has been no true disruptive technological breakthrough in copper mining since the Chile Exploration Company used Nobel's TNT at Chile's Chuquicamata Mine for exponential extraction and production beginning 1915 to meet the copper demands of the electrification of the U.S.
Clean Copper Supply Chain Alliance´s founder used to dream of the Mining Cos "getting it" -- that they alone could be the stimulus for The Common Man to recover his middle class underpinnings, drink pure water without threat of private ownership of acquifers, and live in vibrant mining communities without overt fear of health impacts from smelter pollution. But we have learned the hard way that status quo industrialists do not suffer technologists, nor new thinking coming from without. We quit calling on them; their disposition is to embrace groupthink mandates, fear the new as a threat to Business As Usual, and basically resist nurturing new solutions to old problems based on real innovation because they can disrupt. For example, what is Big Mining´s solution to mine tailing dams now breaking the world over, or continual pollution in developing nations at the mining camps that the average consumer is ignorant and would not tolerate for one week much less five generations. In 2014, one could have witnessed two days of conferencing attended by the top Extractive industry leaders to report on their "Responsible Extractives" new practices only to nary hear the word innovation mentioned. The awesome news is: the world´s copper is literally in the hands of the world´s consumers. And together we, the consumers, do and can control the world economy -- and all the moreso if we can latch on to the copper in our supply chains! Our job as Clean Copper™ Supply Chain Alliance is to bring forth tools related to the copper-in-everything that enables your votes to be felt, not just heard. We have a line up of sport and sporting activities for you to embrace -- and oh by the way, copper is known to be feminine. Google it. Clean Copper™ Supply Chain Alliance exist to educate you the consumer so as to empower you to Vote with Your Dollars as a way to demand CleanCopper™ from your distributors, your retail outlets, your gas station, your local, state, and federal politicians, your baker, your bank. No one, not even the Copper Mining Cos, will be upset with you if you break on through to the other side of the Copper Rainbow. Clean Copper™, oddly enough, will do more for Big Mining than all else! Awaken them! Substitutions come and go but copper is always at The Green Gate of The New New Thing, Humanity´s Brainstorms, its Industrial Revolutions. We need copper to make products into eternity; not so fossil fuels. There will be a day soon when Humanity turns off its last drop of oil, gas, and coal -- not because they dried up, but simply because their use is no longer needed, no longer the right thing to be doing -- to ourselves, our planet, our children´s future, our health, our Petro Dollar based fiat currencies. Solar & Hydrogen -- the enabler of Clean Copper™, on the other hand, will serve Humanity alongside copper until our sun´s energy itself ceases. Copper, once "cleaned" from the upstream to the down, is Humanity´s Opportunity for Success (a Buckminster Fuller phrase). In this section of our website, we make available many rich Infographics expertly done by The Visual Capitalist and their sponsors. Soon we will be introducing our own Infographics demonstrating to you with equally rich numbers and graphics, the how and ease of leveraging CleanCopper™ as the Brand and Mantra to rally around for the consumer-citizens of every walk of life, creed, and race wanting to stimulate their local economies, while also leveraging their purchasing power to begin the empirical End the Use of Oil in your region. Inherent to our Clean Copper™ scenario is Hydrogen Fuel Cell cars and highways. Get Ready! A CleanCopper™ Revolution is upon us. Let the cat out of the bag. The sooner, our better! Alex Peatland of MIT says: “The biggest problem in the world is not global warming, is not war, but how can we organize among ourselves to make good decisions and carry them out”. We believe the adoption of Clean Copper™en masse is the best decision Humanity will ever make for itself. Clean Copper™ is a Branded Planet wide Platform-Solution for _________________(fill in the blank with your Impossible Dream for our Planet, your child, your city) that we can all agree on, even be thrilled by for its magic to always be there for us, cheering us on, like a child with a Cracker Jack box given to him just because it has a different prize in every box. Clean Copper™offers us a new host of new solutions that can trend towards concensus to overcome every ill and evil we all think about standing up to, but quite literally en masse don´t know where to start or how. We would love to hear from you. Allied, we can overcome anything coming at us because somehow, copper is in charge and we as consumers are in charge of how much copper is used on a daily basis and for what.